Anyone who knows me knows that I love gear. Preparing for Kilimanjaro was a good opportunity to upgrade or replace my gear collection. After all, it wouldn’t be acceptable to travel around the world to climb a mountain with last season’s gear. Early on, I identified items that I needed to replace, items that I didn’t have, and items I would like to have. Since we will be climbing with our guides from Embark Expeditions, they will provide all the group gear. This includes kitchen setup, food, tables, chairs, dinning tent, restroom, individual tents as well as any other group type equipment that we might need. Each climber is only responsible to bring items for their personal use. They might also include a card game, candy, or other snack that you might want to share with the larger group. Another benefit of using an experienced climbing and guide service is that they know what you need to make it to the top. This makes it much easier when trying to remember what to bring. I have compiled my gear list for the climb using recommendations from Embark Expeditions. I have also included personal items I know that I need for my camera and comfort, as well as items that I know (or think) I will want. When I am packing, we might leave a lot more out than I initially thought I would take. For this climb, we need to bring two bags. One bag will be carried during the day that includes camera, extra layers, and snacks. The second bag will have the rest of our gear like sleeping bag, and clothes. Our porters that will be assisting us on our climb and will pack this second bag to our camp. Even though the nights can get very cold, I have chosen a 15-degree sleeping bag. To help with warmth, and keeping the bag clean, I also have a bag liner. While sleeping, I will also sleep in a layer to keep me warm throughout the night. My one regret with my sleeping pad is it is narrower than I would like. The wider one would be more comfortable, and be easier to stay on throughout the night. It was also recommended that you bring an emergency blanket. I am opting for the SOL Emergency Bivy. I generally will hike with one in the colder months. I will keep this my daypack. Our porters will collect and boil our drinking water, so I don’t need any kind of filter system. As part of my hiking essentials kit that I always take hiking, I will have a few tablets of chlorine dioxide to treat water if needed. I plan on bringing just enough clothes for the 8-days we will be climbing. To help keep things as clean and comfortable as possible, I will have a set of camp clothes that I will change into once we have arrived to our nightly camp. The only clothing that will be fresh every day will be socks and undergarments. One of the largest upgrades this year was my camera and lenses from a Nikon D5200 to the Nikon D500. I originally wanted to get the Nikon D810, as the Nikon D850 hadn’t been released at the time, and moved into full frame. In the end, my desire for the speed and focus of the Nikon D500 prevailed, getting better-quality wildlife photos was one of the reasons for the upgrade. I will go into more detail on my camera setup in an upcoming post. One of the challenges I have been faced with on this trip is the best way to transport my gear for a three-week trip that has different requirements and limitations depending on the week. For the climb, I am taking only the essentials to save on weight. Keeping electronics charged can be a struggle on any extended hiking trip. The added issue with this climb is the cold. If I don’t keep batteries warm, the cold will affect the overall charge. In my book Backpacking and Camping Essentials, I have included a milliamp (mAh) calculation guide to help you decide what to bring on a trip. In a future post, I will go more in depth in backpacking power options, obstacles and solutions. Whenever you go out hiking, or climbing a mountain, there are basic essentials that you should always take with you. I have modified my essential gear slightly for this climb because of the length and the anticipated adverse conditions. There is a lot to consider when keeping weight down, but at the same time ensuring that you have what you need. I will be doing a test pack in an upcoming post. I want to see if this will all fit, be underweight, and make sure I have everything I need. Keep an eye out for that in the next few weeks. As exciting as gear is, the reason you buy it is to get out and experience the outdoors. This morning I was thinking about one of my favorite hikes, Rudolph Spur in the Columbia River Gorge. Unfortunately, this past summer, due to a massive wildfire, this area is closed until next year. I came across a picture that I took in December 2012. 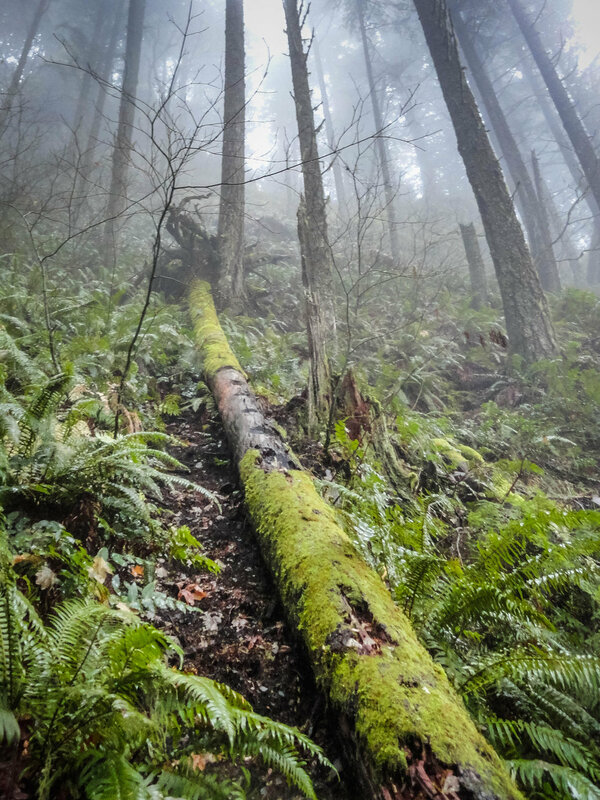 It is a portion of the trail that is rather steep where you use notches that are cut into this log to continue up the trail. On this particular hike, the rain was steady and it was cold, toward the top I did run into light snow. However, it reminds me why I love the outdoors.